Doris becomes an overnight star in this film. The theme song, “It’s Magic”, became one of her signature songs and was nominated for an Academy Award. 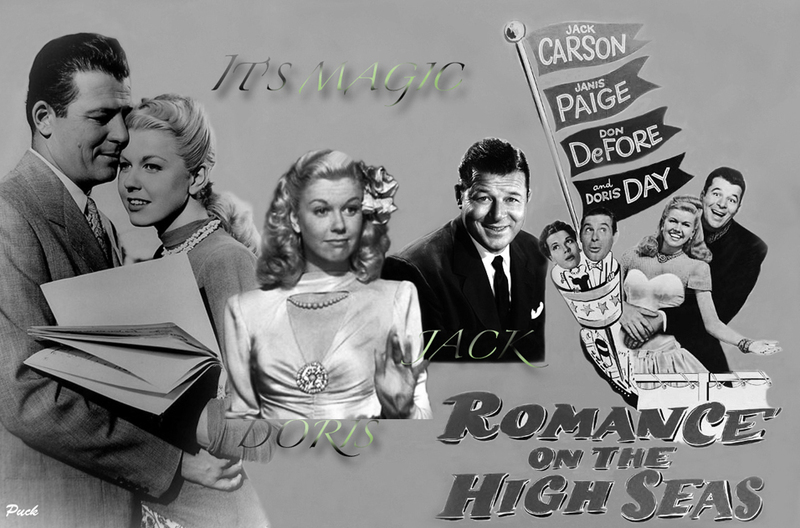 The song was so popular that, in the UK, they retitled the film as “It’s Magic”. Other great songs included: “Put ‘Em in a Box, Tie ‘Em with a Ribbon” and “It’s You or No One For Me”. All were jukebox and DJ favorites. In this delightful first film, Doris plays Georgia Garrett, a nightclub singer who has always wanted to travel abroad. Surprising circumstances provide Georgia a chance to travel on a cruise planned for Elvira Kent (Janis Paige) who scheduled the cruise but at the last minute cancels when she suspects that her husband is cheating on her. She decides to stay at home to check up on him. So she convinces Georgia to go on the cruise in her stead. Dudley: Oh! How do you do, Miss Garrett? Dudley: My, we haven't seen you, let's see now, since you didn't go to Switzerland. Georgia Garrett: Yeah, I got a big kick out of planning that trip. What looks good this time of year? Dudley: How about the Canadian Rockies? Georgia Garrett: Canadian Rockies? Don't you remember? I already haven't been there! Georgia Garrett: Oscar! Aren't you going to kiss me? Oscar Farrar: I don't know how. Will you show me? Oscar Farrar: You don't know how either!